What? I'm using an eyeliner that isn't the Kat Von D Tattoo Liner? I know, it's a miracle. But don't you worry, I'm still using the Kat Von D liner as well. The main reason I consistently repurchase the Kat Von D liquid liner is because it's the only eyeliner I'm able to get a very thin and precise wing. However, that doesn't mean that I don't love other products as just regular liner. Since I wear winged eyeliner every single day (seriously, no joke), I tend to go through tubes quite quick. To save myself the money, I like to use a different eyeliner for the rest of my eye and only use the Kat Von D liner for the wings. 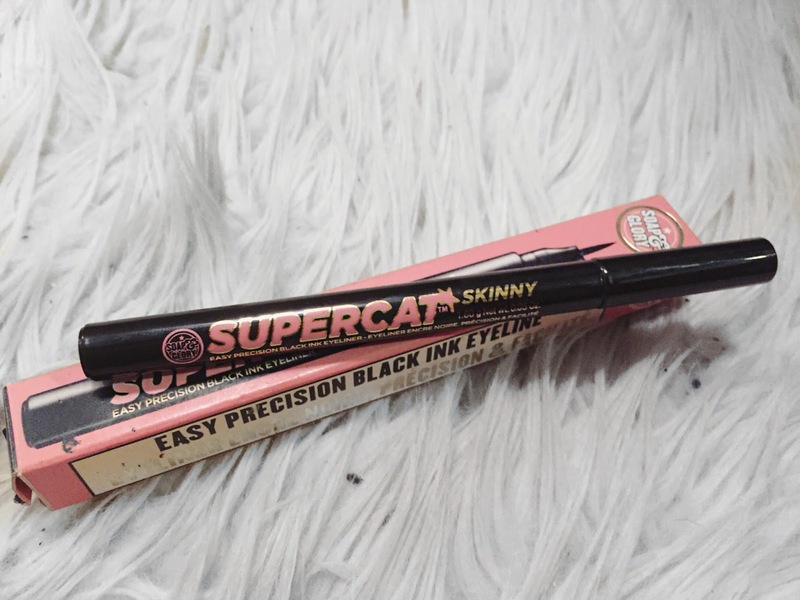 I'd been dying to try the Soap & Glory liquid liner for years after a friend said that's what she used. When my roommate went to London over the summer, she looked at the drugstores to see if they had the liner (it wasn't in the U.S. at the moment, or at least nowhere near me). They were all sold out, which left me Supercat-less. A month or so ago, I was perusing the new display of Soap & Glory products in Target and I thought my eyes were deceiving me when I saw the pink and gold packaging. I picked it up immediately and didn't look back. This eyeliner is a really nice regular eyeliner. The brush it a little too thick and stiff (that's what she said...I'm sorry, please come back, don't exit out of this post...) to get the type of wing that I like to wear. However, it's an amazing eyeliner to use on its own to line your upper lash line! You can make a more thin and precise line if you're careful, but I tend to just make a medium to thick line that I end towards the end of my lashline to leave room for my wing. It's super black and it lasts just as long as my Kat Von D liner. And while I don't particular like it for my wings, that doesn't mean that it won't work for others! I highly recommend picking it up because for ten bucks or so, it's still a great eyeliner, wing or not. I went through a weird phase with sunglasses. I'm very, very particular about the frames that I wear, whether it's sunglasses or prescription glasses. I have a big head, a big face, and a big nose. I know this and I keep it in mind every single time I try on a pair of glasses. For the longest time I didn't buy sunglasses that were more expensive than like, ten bucks, maybe fifteen. Then I bought my first pair of Ray Bans (which I've recently sold because the wayfarer shape just didn't suit me at all), which spiraled into my first high end glasses, a pair of Tory Burch cat-eyes and Chloe round sunnies (both of which I've sold). For a while, the only two glasses I had were my Quay reflective frames and Burberry oxblood glasses (which I'm in the process of selling). 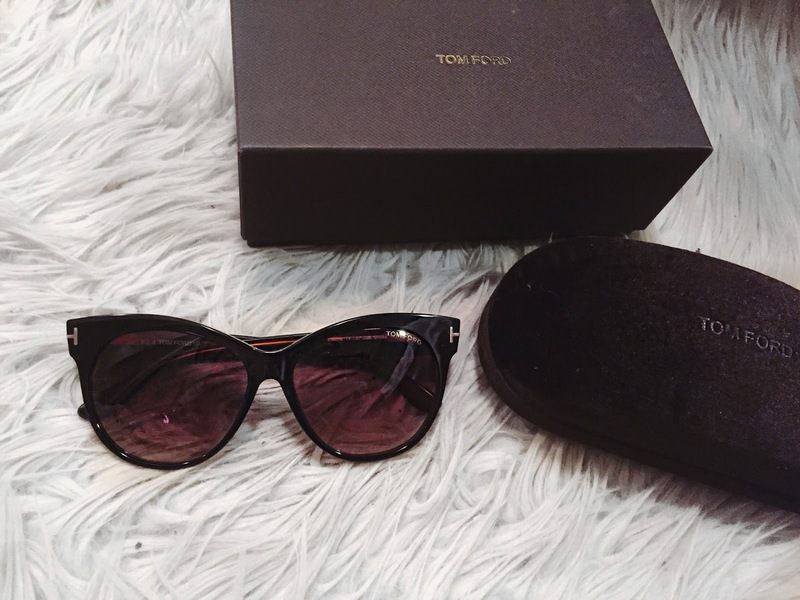 It was love at first sight when I saw these Tom Ford sunglasses come into the store I work in. This cat-eye frame is my power shape, the most flattering style for my face. It just suits me so well and I try to steer clear of any other styles. I also have to be careful about not going too dark with my frames because they're too stark against my fair skin and light hair. These glasses were the perfect shape, perfect frame color, and perfect price ;) You can check them out in more detail in this outfit post from a couple of weeks ago! I've liked Ariana Grande for a while now. I've been listening to her stuff since she first started her solo endeavor. But recently, I've been obsessed and C A N N O T stop listening to her Dangerous Woman album. More specifically, songs like "Everyday," "Touch It" (especially this one), "Thinking Bout You," and "Bad Decisions." I saw her a couple of weeks ago at Quickens and she is just incredible. That's what sparked my decision to immerse myself in her newest album because I couldn't get "Touch It" out of my head for whatever reason. Well, I know what reason: it's just a damn good song. Ariana is obviously uber talented and gets radio play and has incredible collaborations, but just incase you forgot how mega talented she was, here's another reminder to listen to Dangerous Woman all the way through and just bask in her vocal abilities and catchy AF tunes.